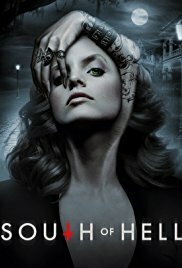 Charleston, South Carolina is an elusive city with many faces and the perfect home for Maria Abascal (Mena Suvari, Chicago Fire), a stunning, 30-year-old demon-hunter-for-hire. Alongside her brother, David (Zachary Booth, Keep the Lights On), she is skilled and fearless in her pursuit of the demons that live in others. Like those that she hunts, Maria is divided within herself, struggling with her own demon, Abigail, who resides inside of her, feeding on the evil Maria exorcises from others. Maria and Abigail share a soul and a destiny, but as Maria desperately tries to overtake Abigail, she will discover how far Abigail will go to remain a part of her. Enos Demon army is revealed to be a brainwashed cult, so David, Maria, Grace and Bledsoe pose as recruits and attend the seminar to learn more. Once they arrive on Sangalo Island, they fear that Enos' trap could be impossible to escape.